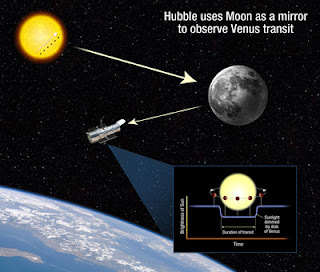 What I Learned Today » See our Earth transit, too! See our Earth transit, too! Perhaps you saw the recent Venus transit of the Sun. But what about an Earth transit? Obviously we can’t see such a phenomenon while sitting on the Earth itself. But some clever astronomers have done calculations to work out when the Earth would transit the Sun from the perspective of other bodies in the solar system, including the Moon and Jupiter. Next: What is Io’s lava made of? What I find particularly interesting is that from the point of view of the outer planets, sometimes Earth’s moon will transit the Sun but Earth won’t, thanks to the tilt of the lunar orbit. This is supposed to happen when viewed from Jupiter in 2060.